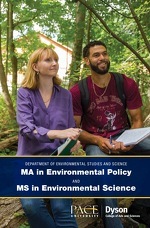 Few universities throughout the New York metropolitan region -- or the nation -- offer the focused and applied professional training that you will find in the Master of Science in Environmental Science (MSES) graduate program at Pace University. Students completing this program will be prepared to address local and global environmental problems facing our planet using cutting-edge technology and scientific research. In addition, many of our graduates go on to further study, such as PhD programs in ecology. Research is an integral part of the program. Students work hand-in-hand with faculty members to conduct field or lab research. Current and past students have done research within our region, as well as globally, exploring everything from mussels in the Hudson River to mammals in India. The experiential learning component of the curriculum is a thesis project that complements a student’s interest. The Program Director connects each student with a faculty member who specializes in the student’s area of interest. Our faculty are the pillars of the MSES program. You will benefit from faculty actively contributing to environmental, scientific, and policy trends. These experienced scholars, who understand the dynamic nature of their fields, will help you connect the concepts you learn in the classroom with real-world applications. Our professors conduct high-quality research and work closely with students not only in helping them to develop their research projects, but also as mentors who provide career guidance and assist with providing networking opportunities that align with each student’s career goals. In addition, our faculty have connections at a diverse set of institutions, including the Environmental Protection Agency, National Park Service, NY Department of Environmental Conservation, NYC Parks and Recreation, and NYC Audubon. We also have associated faculty from the private sector, including private sanctuaries and the American Museum of Natural History. These diverse associations are extremely beneficial, helping our students become professionals through hands-on research at top institutions. The MSES is a 33-35 credit program that can be completed on either a full-time or part-time basis. Most classes are held in the afternoon or evening to accommodate working professionals. Entry into the program requires the following undergraduate courses: one year of general chemistry, one term of organic chemistry, and one year of general biology. College-level physics and calculus are recommended but not required. Scholarship opportunities are available for certain candidates, as well as competitive graduate assistantships.